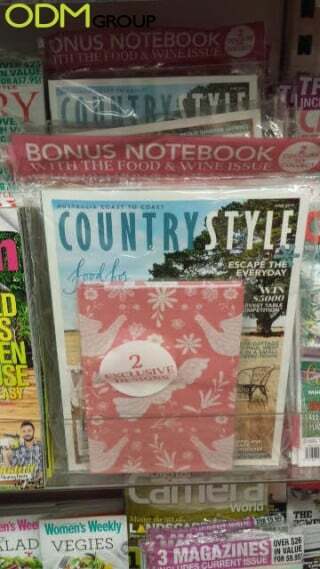 CountryStyle is an Australian lifestyle magazine that specializes in home, food, and gardening related content. The magazine has a notebook as a gift for their on-pack promo. The promo gift is a tool to attract customers to purchase their magazine, instead of competing magazines. Market activation is a method used to “maximize results and provide greatest return for your customer marketing investment“. The strategy includes identifying the right opportunities for the marketing cycle, attracting customers at the right time in making purchase and meet key marketing and business opportunities. Marketing activation strategy includes brand activation and direct response activation. How to use a magazine promo gift for market activation? The notebook promo gift by CountryStyle is a form of direct response activation as the gift attracts customers for direct sales. You can customize the notebook with various patterns and prints in attracting the right customers. Templates of existing designs can be reused in manufacturing the notebook, or alternatively you can custom your own to printed by the manufacturer. They will open a custom printing mould to print your personalized designs on the notebook. One huge benefit of customizing your promo gift is that you can incorporate branding opportunities on the item. For example, you can add company logo on the large flat surface area of the notebook and have it embossed or printed on the cover. Campaign messages, website links and QR codes can be printed either inside or outside of the notebook. This will increase brand awareness and exposure. We have multiple case studies on branded merchandise and magazine gift promo. You can read more by clicking on the links below or contact us here with any inquiry. Our in-house design team, Mindsparkz, can assist you with unique and creative designs for your campaign as well. Practical Giveways to Attract Magazine Subscriptions!